The Everlux Aluminium Frame was developed to support the Everlux safety signs and it is supplied with all the accessories required for its installation. 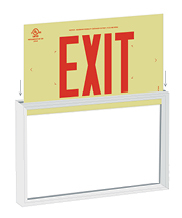 The frame contains an opening at the top, which allows the sign to be inserted. The bracket is supplied with 4 holes to allow for a quick ceiling or wall installation. The frame can be easily adjusted to the bracket by tightening the set screws with the L-wrench. Note: Additional information is available in the complementary document "Instructions for installation”. Everlux Self-assembly aluminum frames can be fixed to the wall using the self-adhesive pads wich are supplied with the frame kit or by using adhesive which is supplied seperately. Everlux Slim-line aluminium frames are supplied pre-fitted to the sign and area ready to install. Everlux Slim-line aliminum frame can be fixed to the wall using self-adhesive pads or tape, Adhesive or other proven methods. It is advised that the receiving surface is clean, dust and grease free. 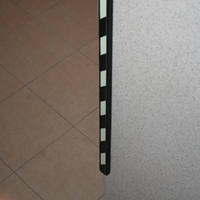 The use of photoluminescent strips outlining the whole door frame allows for the clear identification of the space the user should go through in an emergency. Note: The strips may require to be cutted in order to be adjusted to the size of each specific door frame. 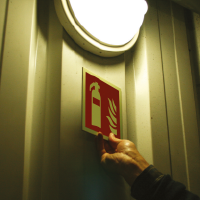 The use of photoluminescent strips to indicate the whole body of an extinguisher allows for the quick and easy identification of the exact location of the equipment, especially in the case of a power cut or power failure. 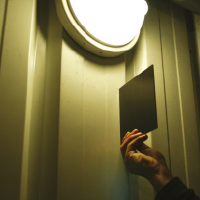 Everlux can supply all type 1 signs with a magnetic finish that will allow a firm adhesion to all suitable metallic surfaces. These signs will offer an alternative solution when installing in a variety of applications such as storage and industrial areas, temporary signage and to a range of metallic surfaces such as doors and fire equipment and are also suitable to be installed indoors or outdoors. In almost all premises there are obstacles that can be hazardous to occupants, particularly in an emergency evacuation. 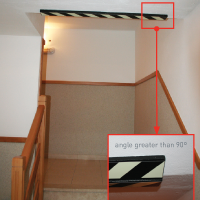 These hazards can include pillars, pipework, machinery and other objects which can protrude from walls, ceilings and walkways. Safety bumpers minimise the potential for injury if a collision occurs. The photoluminescent (phosphorescent) element of the bumper strips ensures that any potential hazards are clearly visible, particularly in the event of an emergency and/or loss of electrical power.